The mobile edition of Injustice: Gods Among Us offers a monthly Challenge Mode where players can pick up a special gold character to add to their arsenal. The challenge can be completed up to three times, with each completion making the challenge harder. Each completion allows a player pick up another of that challenge’s special character so that character can be ‘promoted’ and become more powerful. This guide will help you decide where you should concentrate your efforts when leveling, and promoting characters or when fusing equipment. 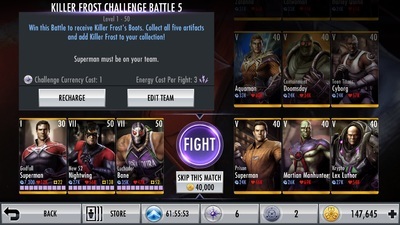 In Injustice Gods Among Us, the challenge mode has five individual challenge battles. Challenge two through five offer prizes for their completion, with the fifth challenge offering that month’s gold character. 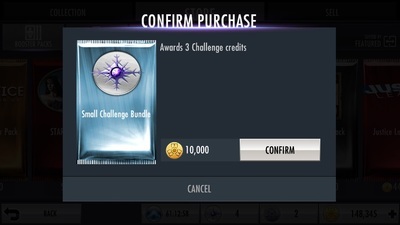 However, this doesn’t mean you can just do the fifth challenge and get the character, all previous challenges must be completed to gain the prize, so it's best to always do the challenges in order. The first four challenge battles each have twelve stages that have to be defeated to complete that challenge stage. 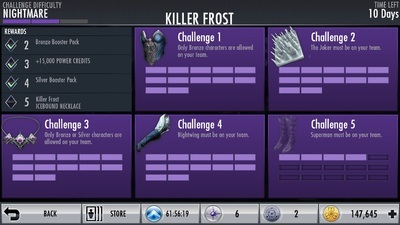 The fifth challenge battle has fifteen stages to battle through. Once all five challenges are complete, the challenge mode resets going from the ‘Standard’ challenge to the ‘Expert’ challenge, then finally to the ‘Nightmare’ challenge. Entering a challenge stage costs a Challenge Credit. You will be provided with 25 credits upon enter each challenge mode for the first time, or once it resets. 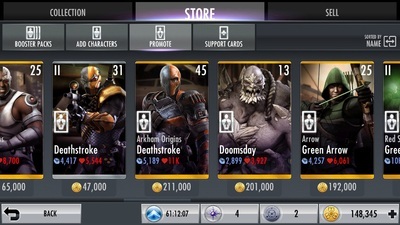 More credits can be obtained by defeating stages in Play mode or ‘Challenge Packs’ can be purchased in the Injustice store in packs of three or in packs of twenty. Defeating the first and third challenge Battles basically takes some high level bronze and silver character. Defeating the ‘Standard’ and ‘Expert’ phases of the challenge can be done with relative ease if your characters are at the max level of 50 and fully promoted. Without full levels and promotions, it will be very challenging to defeat the ‘Nightmare’ phase. 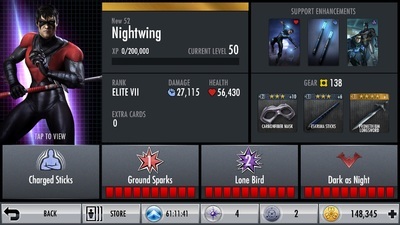 To defeat all three phases, you should have a team of three bronze characters and a team of three silver characters maxed out, and have all of their equipment slots available and filled with equipment. If you need help maxing out your characters, check out my power leveling guide. For Challenge Battles two, four and five, there are no restriction in regard to character metal, so instead of bronze and silver characters, we can use gold ones. Unfortunately this does not mean your characters don’t need to be maxed out for the ‘Nightmare’ phase. 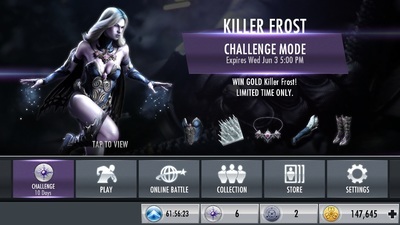 For these Challenge Battles, you will want two gold characters maxed out in terms of level and promotions. You will also want all of their equipment slots opened up. The third slot in your team will be whichever character the challenge requires you to have on your team, if it’s not already one of your maxed out characters. If possible, I recommend maxing out characters you've obtain through past defeating past Challenge Modes and using them for future challenges. Challenge characters are often more powerful than the basic gold characters, however the basic gold characters cost a less credits to promote. You may need to start with basic characters and then upgrade to challenge characters in time. You may also want to stock up on credits while battling through the challenges as you may need to spend some credits upgrading the required characters to make it through the ‘Nightmare’ phase. What you really need to defeat all the challenge modes are nine key pieces of equipment. 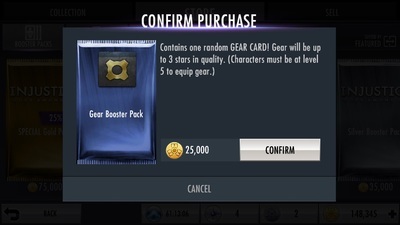 Equipment is dolled out randomly via the Gear Booster or Gear Locker Packs available in the store, by ranking in Online Play, or by completing the ‘Expert’ and ‘Nightmare’ phases of the current Challenge Mode. Gear is rated with stars, the more star the more powerful the item. Ultimately, having nine three-star or four-star pieces of equipment. 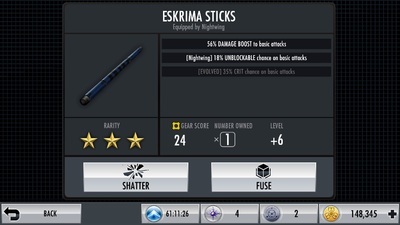 Equipment can be fused with shards to become more powerful. Shards are obtained by shattering equipment, so you basically sacrifice (shatter) weak equipment to upgrade (fuse) powerful equipment. Equipment can be upgraded up to ten times. When upgraded an eleventh time, the equipment morphs into a new more powerful piece of equipment. You will need to move around your equipment from character to character as you progress through each challenge. 3 Bronze characters at level 50, promoted 7 times, and with all equipment slots available. 3 Silver characters at level 50, promoted 7 times, and with all equipment slots available. 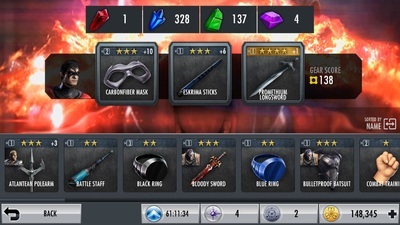 2 Gold characters at level 50, promoted 7 times, and with all equipment slots available. 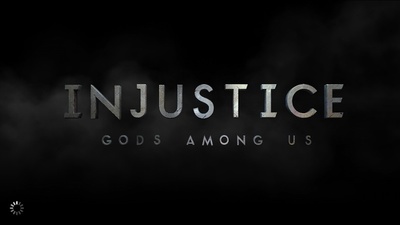 Want more info on Injustice Gods Among Us? Check out the game review or the leveling guide. If you like Injustice, you might also like Marvel Contest of Champions for more mobile fighting action.